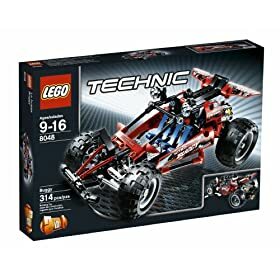 New images and further info about the 1H2010 LEGO Technic sets, are now available from Amazon.com. 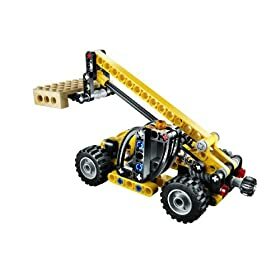 Set description: Use the rear-mounted control knob to raise and lower the Mini Telehandler’s fully-functional boom and forks. 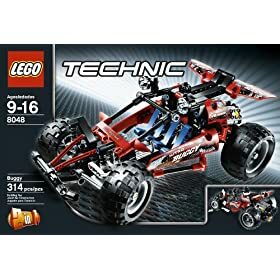 For even more fun, you can rebuild it into an authentic LEGO Technic motorcycle with side car. 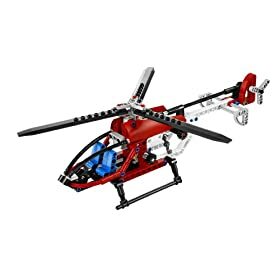 Set description: Turn the gear wheel on this realistic helicopter model to make the main and tail rotors spin together, while another gear operates the working winch to lift heavy loads. You can even rebuild it into a seaplane for even more functional LEGO Technic fun. Set description: Make quick work of tough digging jobs with the Compact Excavator. Drive around the job site on working belt treads, and use the control knobs to operate the articulated arm and shovel like a pro. Cabin platform rotates 360 degrees. 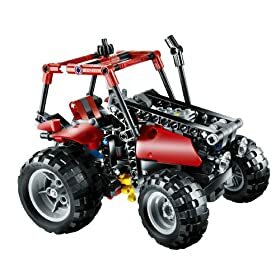 Set description: Bounce over rugged off-road terrain with this dune buggy with working four-wheel suspension. 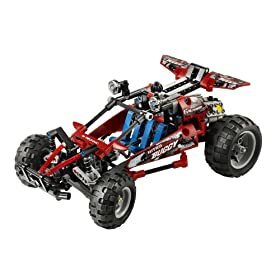 You can rotate the steering wheel to steer the tires, open the cab roll-cage, and see the V4 engine pistons really move when the vehicle rolls. Set description: No logging job is too big for this impressive log loader. Use the control knob to steer the tractor to the trailer, then hitch them up. 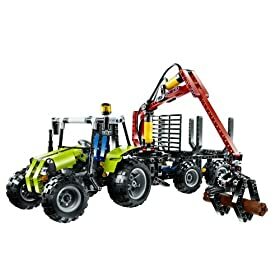 Take control of two pneumatic-like valves to operate the fully-articulated crane arm and pick up the log with the working grabber. Realistic and functional. Again according to the description, it looks the B-model will be a log handler. 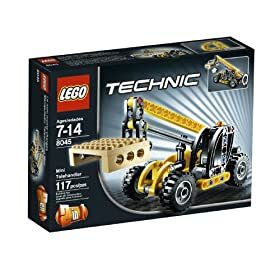 And for this semester largest Technic set, which is reintroducing the pneumatics into the LEGO Techni theme, it looks it is foreseen the possibility to incorporate compressor functionality, through the 8293 kit. This is something not seen into an official set for long time. From the info available it looks there will be no air tank for the mentioned compressor. Also the possibility seems to be a PF M-motor, driving the large pneumatic pump, which I wonder to see how stable it will turn to be, into a set this sized. There are already some new parts visible, but that goes into the following post. I'm a bit neutral in relation to the Telehandler. 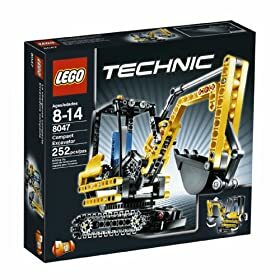 It's nice that it's a "little bro" of the 8295, just like the 8275/8259 duo. 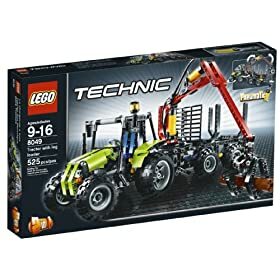 But I feel something "meh" about it... then again, maybe it's just my personal, I have no idea why, indifference towards LEGO telehandlers: I feel the same for the 8295 and the 8283. I really like the Helicopter's sleek looks and additional gimmick in the form of the winch, but rotor actuation through a gear!? The 8265 Front Loader, when not motorised, is infamous for giving carpal tunnel syndrome through the gear in its rear, and this one too has a gear instead of a crank! Oh dear. But, overall, it appears to be a good balance of size/functions. 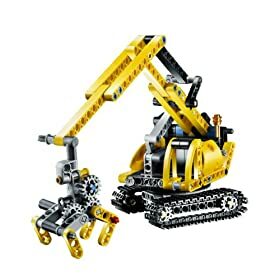 For some reason, the Compact Excavator doesn't appeal to me much, a bit like the Mini Telehandler. Is it the yellow? However, I'm glad to see that, unlike what I supposed, both arm actions (boom and dipper/shovel) are worm-driven. Also, the small blade in the front, like real compact excavators have, is a welcome little extra. From the pictures, it appears to be manually moveable, which is expected at this price point. No complaints from me on this front! The B-model looks nice, but, at least from this angle, a bit cluttered. Whoa, dune buggy with tractor B-model! Where could I have seen this? ;) Anyway, strangely I liked it better from the angles on the leaked photos than on the official photos, so I'll have to see it from other angles to make a decision. Still, overall in my opinion it combines both good looks and good functionality. For now, I can't say the same, however, for the B-model. It looks quite realistic, but I don't see what functionality besides steering and two (!) cylinder engine it may have. Like the 8261 Rally Truck (and the 8284 Tractor too, now that I mention it), it looks it was created just that "you can make another model using these parts" can be said. I'm not complaining, though: any variety is good! Finally, the "King Sebastian of Pneumatics". I'm really happy there's a mechanism for turning the arm! 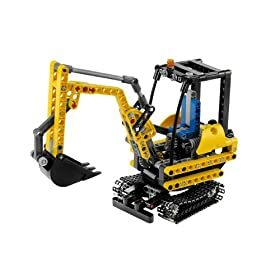 On small models like the Compact Excavator this is acceptable, but not on large models. The number 8421 pops into my mind... 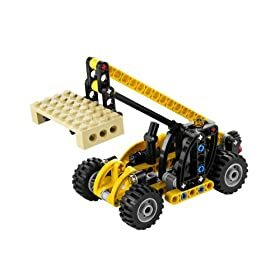 If the B-model is also a log loader, I definitely believe it is something like many fans (myself included) thought the A-model would be: something like this, or perhaps like the 8433 Log Loader. Note that both have two pneumatic cylinders! As for a possible motorisation using an M-motor with the large pump, I'm not saying it's impossible but I'd like to see that! Another possibility is a bonus part, like the 8438 Pneumatic Crane Truck (but not its two previous editions) with two extra cylinders. 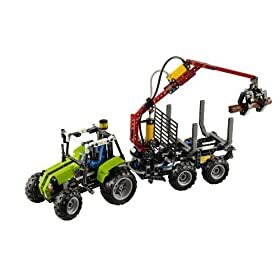 In this case, it would be truly great if the set came with a small pump, to be used with the motor! Another factor in favour of the latter hypothesis is the fact that the instructions for the compressor in the 9641 Pneumatics Add-On Set, which has both a large and a small pump, use the small pump and not the large one. I think I rather like the mini telehandler. 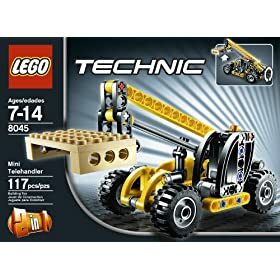 Sure, it's not the most exciting model, but I've gotten a few different mini Technic sets in the past, and they're really about boiling a complex machine down to one or two functions. A kind of universal minimalism, if you will. I think it's nifty. 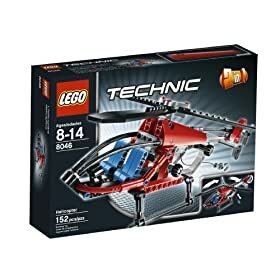 The helicopter is an interesting choice. 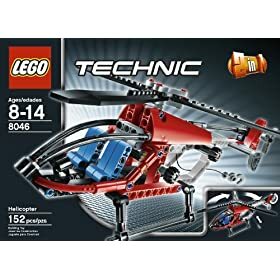 Although the idea of making flying machines out of Technic has never really appealed to me (because it's impossible for them to succeed at their defining function), but I still appreciate the set. It looks very nice, and will be a lot of fun for those who buy it. 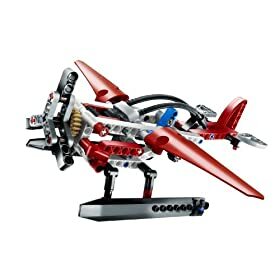 Obviously, the swoosh factor will be the highest in any Technic set for a while. 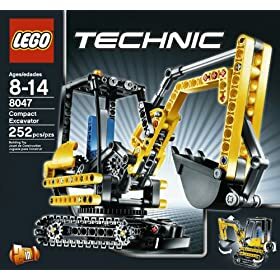 The excavator is a little boring for me, although I like that LEGO is taking an unconventional route by choosing a small one. In any case, it's a fantastic parts pack. With the buggy, we get to the good stuff. I had the white ATV, which was a blast, but this looks a little nicer. It looks like a great starter kit for car builders. "The 8265 Front Loader, when not motorised, is infamous for giving carpal tunnel syndrome through the gear in its rear"
Very true but I do believe that's got more to do with it having Linear Actuators ;^). I've tried replacing the gear with different handles but the results were never that satisfying. It keeps getting better. I didnt 'need' the log loader until the possible add-on compressor. Cant wait to see what TLG has devised. And this is just the 1st half of 2010 sets! "And this is just the 1st half of 2010 sets!" That reminds me: this is year 2010 we're talking about, an even year. 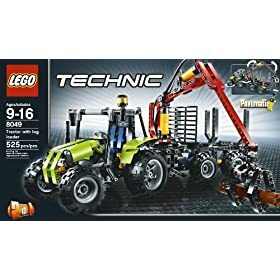 It is generally accepted that TECHNIC flagship sets for odd years tend to be more fondly remembered by fans than their even year counterparts. With the return of pneumatics (and thus the door for PF pneumatic elements being open), will this tradition be broken? At this point (we're still in 2009, after all), only time (and TLG) knows!